Welcome to Manny’s Organ Service. 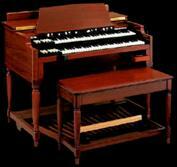 We specialize in Hammond Organ and Leslie Repair. Classic Hammond organs DO require periodic maintenance, many times poor performance or problems are linked to lack of proper care. If your Hammond is “trashed” WHY would anyone offer you a high trade-in value?? With new organ systems costing upwards of $20,000.00, you owe it to yourself to get the STRAIGHT ANSWER. Classic Hammond organs were among the best built equipment ever made, DON’T accept a DOA diagnosis before talking to us. WE CAN REBUILD IT!